We’re nearing the end of a mini-event and, of course, that means it’s time to speculate on what’s next! But before you get too excited and try to read to much into it…remember the last several teasers that hit our games have had NOTHING to do with the next event. Remember the fortune teller before THOH or the Cayman Island Banker before Moe’s Ark? The list goes on and on. So don’t read too much into it…yet! Or read everything into it! It’s Christmas! Who isn’t excited?! Now, let the speculation begin! Oh and don’t forget to watch Addicts Live on Saturday (Dec. 1st) at noon ET, where we’ll talk ALL things Christmas 2018! Tagged Christmas 2018 Teaser, Tapped Out Tips and Tricks, The Simpsons Tapped Out, TSTO Addicts, TSTO Christmas 2018, TSTO Tips and Tricks, What's coming in the TSTO Christmas event, when will TSTO Christmas Start? What are your overall thoughts on the Thanksgiving mini-event? Premium items you purchased? Mystery boxes opened? Where have you placed the prizes? Sound off in the comments below, you know we love hearing from you! 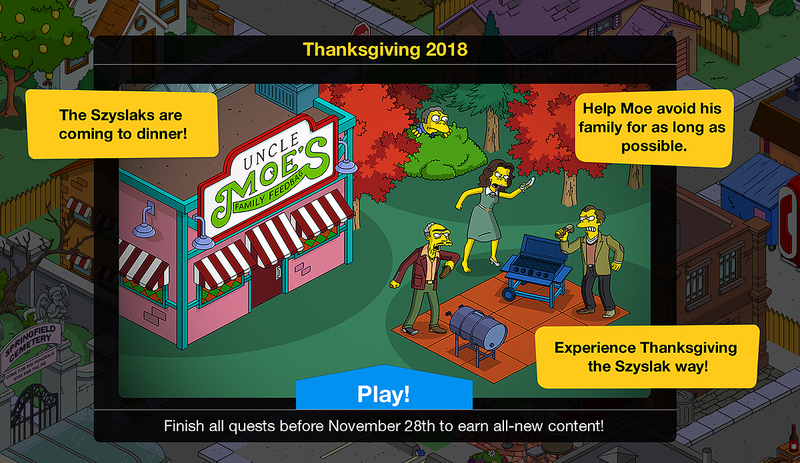 Tagged Tapped Out Tips and Tricks, The Simpsons Tapped Out, TSTO Addicts, Tsto Thanksgiving mini event, TSTO Tips and Tricks, Whats next in TSTO?, when does the Thanksgiving mini event end?